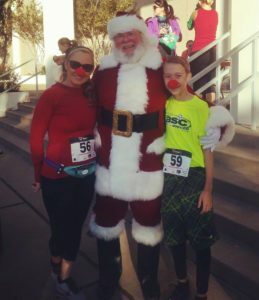 Junior League of Abilene, in partnership with the Abilene Downtown Association, will host the annual Reindeer Run 5K through the merry streets of downtown as part of the City Sidewalks festival on Saturday, December 1. This fundraising event supports the Junior League of Abilene as we continue to help fund projects, programming and events benefiting the services to help women and children of the Big Country. Partial proceeds also allow for the continued support of Downtown Abilene. Late registration available at packet pick up from 3-7 pm on Friday, Nov. 30 at the lobby of the Enterprise building (500 Chestnut St) or from 7:30-8:30 am on Saturday, Dec. 1 at the registration table at the Abilene Convention Center (south entrance). Click here to view the course map for the Reindeer Run 5K. Packet pick up and late registration available on Friday, November 30 from 3-7 pm at the first floor lobby of the Enterprise building (south entrance), 500 Chestnut St. Light holiday refreshments to be served. Race begins promptly at 9 a.m. with the start/finish line at the south entrance of the Abilene Convention Center.